Dr. Avnish Jolly, Chandigarh, 2nd October :Sate Leprosy Society celebrates the birth anniversary of Mahatma Gandhi today by flagging off a rally by Director Health Services Dr. M. S. Bains from MCM DAV College followed by “Leprosy Awareness” lecture by Dr. Uma Vasudeva MO Leprosy. Others present at the rally were state Leprosy Officer Dr. S. D. Mehta, Dr. Punit Bedi, Principal of the college, faculty members, programme officers and NSS volunteers. This rally has been organised in collaboration with an ongoing 10 days NSS Camp as part of Health education Programme for the youth of Chandigarh by NSS Directorate Panjab University. 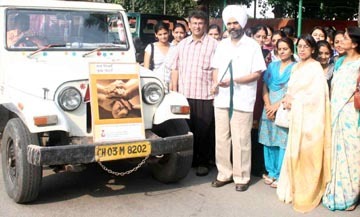 This rally comprised of posters and panels mounted on trucks and leprosy vehicle of the society which has been converted into a walkie talky leprosy programme shuttle along with the leprosy staff carrying placards and conveying messages educating people about importance of early detection and treatment to prevent permanent disabilities. The treatment of leprosy and the disability caused by leprosy is provided free of cost by Government of India. This rally is the culmination of the NSS Camps in Chandigarh commencing from 26th September, where series of lectures on leprosy awareness have been delivered by Dr. Vasudeva as a health education programme to about 1000 NSS volunteers from namely: S D College, Government College Sector 42, Dev Smaj College, Home Science College and MCM DAV College and conveyed the message to the youth “To accept Leprosy as a simple curable disease and encourage people to seek and comply with treatment. The society must change its attitude and take it as their social responsibility to change the face of leprosy”. Message for the community: It is caused by a germ, a pale/reddish patch that lacks sensation is a sign of leprosy. MDT kills germs and stops spread of leprosy. MDT is available free of cost at all leprosy clinics.